However the fact of the matter is that whoever wins the next election (which according to the general election forecast will be the Conservatives on a projection of 343 seats, against Labours 225) will have no choice but to make deep cuts in public spending and large increases in taxes as Gordon Brown has put Britain on the path to bankruptcy to maximise the number of seats that Labour will retain at the next general election which is forecast to be held during May 2010. Any politician that is saying anything different i.e. 99.9% of politicians, are basically lying to the electorate. Whilst the UK economy is on track to bounce back strongly into 2010, as indicated by the recent in depth analysis, however this economic recovery is based purely on debt as shown by the graph below, as the Labour government's strategy is to deliver the next Conservative government a scorched earth economy. Alistair Darling's forecast for government net borrowing for 2009 and 2010 in November 2008 totaled just £70 billion. However, since the amount of projected borrowing has mushroomed to £350 billion, which is set against my November forecast of £405 billion for 2009 and 2010 alone, with continuing subsequent large budget deficits thereafter of more than £100 billion a year. Deep Cuts in Public Spending Expected. Today's backtracking by all politicians from the minimum 10% cut in public spending hides the fact that even if the economy recovers strongly into 2010 (as forecast in Feb 09, some 4 months ahead of the National Institute of Economic and Social Research (NIESR)), however this recovery will still not be able to significantly erode the annual budget deficit which will remain at £100 billion+ per year unless the government makes deep across the board cuts in public spending of at LEAST 10%, which would equate to a cut in public spending of some £60 billion per year, well beyond talk of £3 billion here and £3 billion there for sub £10 billion totals. The British electorate needs to realise this that the real pain that they are going to endure for a decade or more will come AFTER the next election when the government has no choice but to both slash public spending and raise taxes as the alternative would be to ignite an out of control debt spiral (which we are already in at this moment in time). Under the Labour government the public sector has become a funding black hole that threatens to bankrupt Britain, which is illustrated by the NHS spending black hole that has grown to more than 10% of GDP from 3.5% of GDP in 1948 that carries more than a million passengers on its its gravy train. As mentioned before every extra £1 spent on the NHS only generates barely 10p in increased output, where Britain spends 3 times the amount on the NHS per capita than most Eastern European States that still somehow manage to delivery a better health service and leaves Britain languishing at the bottom of the European Health leagues. Incompetence, greed and waste are the operate words, NOT value for money or putting patients first as illustrated by an opinion poll amongst 156,000 NHS staff that found that patient care is not a top priority for the NHS. It is no wonder that patients in their hundreds of thousands are seeking private health screening and GP services. Nothing illustrates the NHS spending black hole under the Labour Government more then the debacle over GP Pay Contracts as the below graph illustrates. The new contracts that came into force for the year 2003-04 saw GP Pay soar during the following 3 years by as much as 35% per annum. If GP Pay had grown in line with average earnings then the current average GP salary should be £68,000 against the actual average of over £125,000. In fact the MP expenses scandal is in part attributable to the huge pay disparity that has grown up in recent years between MP pay and GP Pay as when Labour came to power in 1997 average MP pay was £43,722 against average NHS GP pay of £44,000, so both were inline with one another at that time. 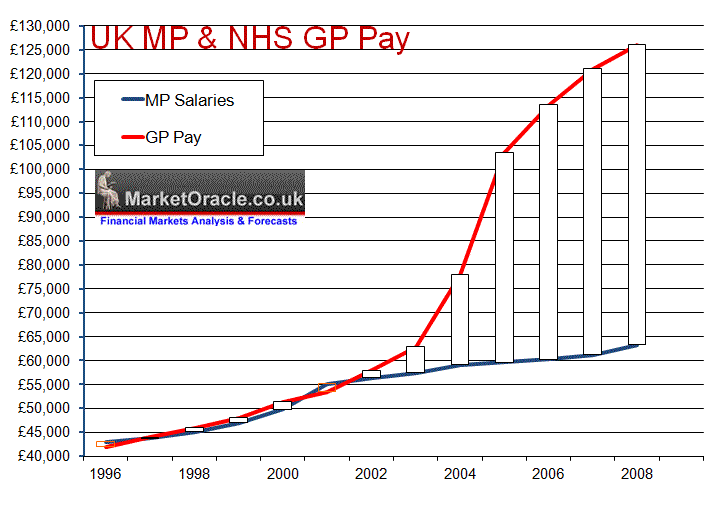 However as the below graph clearly illustrates in 2003 something started to go seriously wrong with GP Pay which took off into the stratosphere as GP's awarded themselves pay hikes of more than 30% per annum that has lifted average GP pay to £126,000 per annum against £64,000 for MP's. As I have warned several times over the past 12 months and which is now starting to come to pass in that total liabilities are set to grow from £1.75 billion at the end of 2007 to £3.9 trillion by the end of 2010 as a consequence of the £2 trillion of liabilities of the bankrupt banking sector being ceremoniously dumped onto the tax payers in addition to the public sector deficit spending of £600 billion on which the country will have to pay interest on which worsens the fiscal situation during each subsequent year hence the risk of an out of the real risk of an out of control debt spiral. The consequences of all this deficit spending and growth in liabilities is highly inflationary as the Governments Big Idea of "Printing Money" WLL eventually lead to hyperinflation as 1920's Weimar Germany found out, so Britain IS sowing the seeds of much higher inflation, maybe not this year and for the first half of 2010 as recent inflation analysis illustrated, but there will be a deficit spending and quantitative easing day of reckoning in terms of economic stagnation coupled with high inflation that will land on David Cameron's lap. Total GDP contraction to date now stands at -4% on a quarter on quarter basis, which is against my forecast for -6.3% total into Q3 2009, however recent analysis strongly suggests that GDP contraction during the 2nd and 3rd quarters for 2009 is moderating and points to a strong bounce back in the economy into the 2010 election given the extreme measures adopted of deficit spending of £500+ to generate just £67 billion of additional economic growth, however the post general election tax hikes and deep public spending cuts will my opinion trigger a double dip recession during 2011 to 2012 as illustrated by the below graph. Therefore my growing expectations are now for recession GDP contraction that is less than the forecast -6.3%, which also implies stronger growth during 2010, which will NOT be sustained during 2011 and beyond as the economy does an about turn on under the weight of the unsustainable debt mountain. The solutions to Britians debt crisis remain as much as voiced in the November 2008 article - Bankrupt Britain Trending Towards Hyper-Inflation?, and expanded upon during February 2009. The really radical long-term solution of privatisation of the large un-productive entities such as the NHS would require a large majority government which does not appear likely at this point, which therefore suggests that the next government will fail to fully address Britain's growing debt problem that for each extra £100 billion borrowed will result in extra annual interest payments of at least £5 billion, therefore £500 billion of new debt will add an extra £25 to £30 billion in interest to Britain's debt mountain which is more than Britain earns from North Sea Oil (£17 billion) and therefore threatens to send debt spiraling out of control unless drastic action is taken to bring public debt under control. My next in-depth analysis will aim to update the UK interest rate forecast of December 2008 that called for UK interest rates to start rising during the second half of 2009 as illustrated by the graph below. To receive the in-depth analysis in your email box, make sure your subscribed to my always free newsletter.